The route of next year’s Tour de France looks like the perfect opportunity for Mark Cavendish to move himself up the list of all time stage winners, but the challenge for the green jersey may have just changed completely. The Manxman currently has 15 Tour stage wins under his belt and admitted to Cycling Weekly that there were six stages that looked good to him as he watched the route presentation in the Palais des Congress in Paris. The Tour’s website say there are ten flat stages, and we saw eight that looked like potential bunch sprints. If Cavendish wins five stages next year – the number he has averaged over the last three years – he will move himself up to joint sixth with Nicolas Frantz of Luxembourg on 20 wins. Above him sits Lance Armstrong and André Darrigade on 22 wins. Merckx tops the table with 34 wins from 1969 to 1975. Cavendish’s quest for the green jersey may have just been turned on it’s head. During the presentation, where Cavendish was sat next to new world champion Thor Hushovd, ASO announced that there would be just one intermediate sprint per flat stage and that the first 15 riders over the line will score points. Previously just 6, 4 and 2 points were available in intermediate sprints. The idea is to involve the sprinters in the intermediate sprints even when the bunch role through several minutes behind a break. Cavendish has always said his best chance of winning the green jersey was to win stages and therefore score maximum points, this may force him to change his tactics. ASO hasn’t confirmed how many points will be available although many believe it to be 20 for the first rider and a sliding scale down from there. Flat stages have always awarded 35 points to the winner. Garmin-Transitions boss Jonathan Vaughters said that this new points allocation would favour Thor Hushovd as he was able to get in to breaks and pick up points. 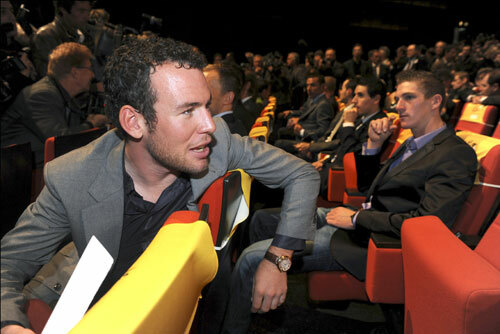 Cavendish remained unsure saying that the new system may change the way HTC ride.